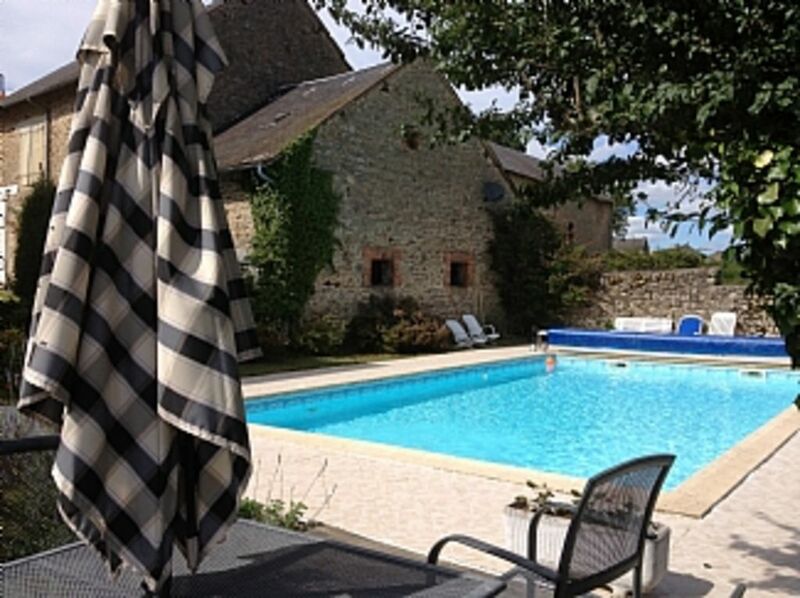 Our gite is located in the grounds of our house but is entirely separate and private. The house, gite and various barns are surrounded by 11 acres of grounds The front door leads straight into a large stone walled living room dining area with log burning fire. From here you continue through a stable door which leads into a kitchen with large dining area. This has french doors or as the French call them 'doors' leading out to a decking area and fields. Upstairs another very large living area leads onto the 3 en-suite bedrooms which consist of double beds, two with bunk beds. Two of the en-suites can be accessed from the living area if required. Outside there are various barns leading down to our 25 x 12ft south facing pool with seating and decking areas. Our front lawn lends itself to racket games and our gardens are free for you to use. Living area has 'FreeSat' providing English channels and a library of over 200 DVD's. English board games (Chess is universal). We supply a welcome pack on arrival comprising bread, cheese, ham, milk butter, coffee, tea, milk, beer and wine just to get you started. I will try and accommodate any reasonable request for other language material - just let me know what will make your holiday the best so far and I'll do my best to make it happen. I fell in love with this property the first time I saw it. it has a superb location but really what made it was the views. From every window in the house, from every point in the garden, from the swimming pool, they are just superb. The minute I arrive here from I feel the weight of the world disappear. Le Masbeau is a small hamlet of six homes but not isolated. The local village is 5 minutes down the road, the nearest town is 15 minutes and Gueret (30 minutes) and Limoges (50 minutes) offer everything else you might want. The views, the peace, the pool. En-suite shower rooms to all bedrooms. Two of which are accessible from the upstairs living area. Air conditioning to the breakfast area and upstairs lounge area only. Fans can be supplied on request at no extra cost. All bedding, tea towels and table cloths are provided. We normally recommend that you supply your own towels but can provide towels at no extra cost. Garage parking can be made available if required. Stone walled living/dining area has a comfy leather chesterfield and two seater sofa situated around the log burner. The dining room table seats 6-8 comfortably. There is a large dresser containing many books and games. Electric oven and gas hob, microwave and fridge freezer. There is a dishwasher and washing machine situated in the dining area next to the kitchen. Filter coffee machine and toaster. Mostly English French and Dutch. The immediate garden extends to about 1/2 acre but you have access to the whole property of about 12 acres. The whole area is rural and sparsely populated so superb walks, bike rides and dog runs. Boat hire, both wind and motor is available in Lac du Vavissiere together with wind surfers at extremely attractive rates. Water skiing is available at two centers on the lake. Situated outside the French Doors overlooking the fields beyound. Wet Suits available. I can provide a limited number of wet suits if required at no extra cost. 2 hours to the Puy de Dome and Massif Central ski areas including Mont Dore and Super Besse. A beautiful French family resort. Tennis is available in Saint Dizier Leyrenne (5 minutes) but you will need to source this locally. Bourganeuf (10 minutes by car) has a 9 hole golf course with a small clubhouse and restaurant. You will need to source this locally. The pool is for your exclusive use during the hours of 9.00 to 16.00. Situated adjacent to the property with beautiful views. Unheated but lovely on a hot summers day. We stayed for two weeks with our 4 children and small dog. It is a lovely area, great for circular walks. The pool is in an enclosed area so good for young children. The lakes about half an hour away are perfect for swimming in a beach type environment and good for watersports. We stayed in a very hot period and the air conditioning is quite limited (something to be aware of if this is important to you). Also to be aware is the WIFI in the property is very slow and only available by the front door (there is some 4G reception though instead). Owner very helpful as required. Overall we had a good holiday. Lake Vassiviere is only 30 minutes by car (approximately). The lake is set in a beautiful wooded, natural environment. There are six sandy beaches to laze on with dedicated areas for swimming and life guards in attendance during the season. Plenty of water based activities including fishing, sailing, wind surfing and water skiing as well as restaurants and cafes. My favourites include L'Escale for lunch, very relaxed and friendly - when I left a tip for the waiter he came and found me to shake my hand in thanks! Overlooking the lake it has an exceptional buffet to accompany your main course. They also offer dinner cruises on the lake. For dinner I love Le Puy du Coucou situated just outside Royere de Vassiviere but you need a SatNav to find it and you must book! You can also visit the Ille de Vassiviere which is an arts centre on an island in the lake. This is accessible by foot, water bus or 'Dotto Train'. Coming home from the lake we always manage to find a reason to stop at L'Atelier in Royere de Vassiviere. A bar with decent beer, wine, food and during July and August a superb music offering. Limoges airport is 50 minutes from the cottage. Ryanair operate flights from Liverpool, East Midlands, Stanstead, Edinburgh,Bristol and Leeds. Flybe fly from Southampton, Newcastle, Edinburgh, Manchester, Birmingham and Gatwick. BA are operating from Gatwick from May 2017. Car hire companies include Avis, Hertz, Europecar and National. A car is essential to make the most of the surrounding areas. The port of Le Havre is approximately 5 hours and Calais around 7 hours. The 12th century town of Bourganeuf is less than a 15 minute drive from the gite and offers shops, bars, cinema and a market on Wednesday. As is common in this area you have a lovely choice of superb lunch venues but little to offer in the evenings other than kebabs and pizzas so you will have to travel to get a decent dinner - probably about 30 minutes. Saying that you will get some excellent options. The town of La Souterraine is about 20 minutes away and Gueret, the capital of the Cruese is a 30 minute drive. From there you can explore the 15 and 16th century castles and Renaissance buildings. Aubusson, the tapestry capital of France is less than 30 minutes away. Aubusson is on the banks of the beautiful Cruese river and has been making tapestry since the 15th century. The stunning Limoges Cathedral often has art installations situated in their impressive gardens, the most recent (April 2016) by Marc Petit with a thought provoking and somewhat disturbing collection. All this set in a superb medieval setting. Cafes, restaurant and bars adjacent. The nearest village is Saint Dizier Leyrenne where there is a tabac / cafe / hotel / restaurant / taxi service (all the same place) run by Madame Chaumbreu. A four course lunch including wine costs 13 euros (about £11) but you don't get a menu, you get what she's cooked and you have to book or be there for 12.00 (this part of France stops between 12.00 and 2.00 strangely including my internet bank! ) Never had a bad meal though! Small supermarket, post office, pharmacy and hairdresser along with a lovely Norman church. This is just a 5 minute drive or a wonderful downhill bike ride (not so wonderful coming back up!) from Le Petite Nid. There are adult and children's bikes free for your use in the barn including a monocycle used at your own risk. Booking Notes: A 25% deposit is required then the balance 8 weeks prior to the commencement of your holiday. Full payment will be required if confirmation is less than 8 weeks. We ask that you make a cleaning/breakages deposit of £150 which will be returned upon a satisfactory departure within 14 days. We also ask that the gite is left as clean and tidy as possible. Changeover Day: Normal change over is Saturday however we will always try to accommodate alternative requirements.